I have the Richa Slick boots which are fabulous, but wanted a taller pair for colder days. These are warm, comfortable and a reasonable price. Went for a size larger than usual and they're fine. Great service yet again from SBS. Thank you. At the age of 50 I've decided to learn how to ride a motorbike. Not knowing anything about the clothes I picked these due to priceand style. I wanted a plain black boot. I thought entry level. They are comfortable and not restrictive. The zip is sturdy and the fold over Velcro strip adds to the waterproof seal. I have given them four stars as these are my first ever pair. First fast delivery and well packaged. I opted for a size up as per other reviews, though a little big when on, leaving room for thick socks, I think I would have had trouble getting my normal size on. Overall a good solid boot, comfortable and warm. With a secure zip and Velcro closure. Great comfortable boots, not used them in a torrential downpour so unable to say how waterproof they are, appear well made and look like they will last a long time. These boots have been warm, dry, and comfortable. Can't ask for much more really. First pair of boots from Richa....and I have to say, with cold or rain my feet are always hot and dry. Comfortable boots, I ride with them everyday...And yes I will for sure by another pair! Had a pair of these boots about 3 year's ago, wore the left boot out on gear leaver ( should have changed the rubber) . So impressed by their performance had to buy another pair. Warm and dry never let the water in. Like other reviews they are a little tight but apart from that a great boot. I have used these boots since I first started riding. At first because they were cheap, and then because they were cheap but still did the job every other boot does. This latest pair though. The sizing has got even smaller and the zip on one of the boots went after a month. I used to get these for a year and a half at a time- maybe it's a batch issue or a new manufacturer or something, but these aren't the boots they used to be. Can these mens boots fit a wide calf??? They are not overly spacious - the Spada Hurricane 2 boot would be a better choice if you have wide calf. Do you have these boots have a wide fitting size available? 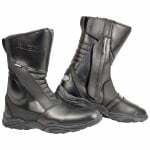 The Richa Zenith boot is approximately 10.5 inches in height.